Formed in 1990 by bandoneon player Romulo Larrea, the Ensemble tirelessly explores the pulsating world of tango and has distinguished itself as an outstanding ambassador of the genre in international cultural circles. 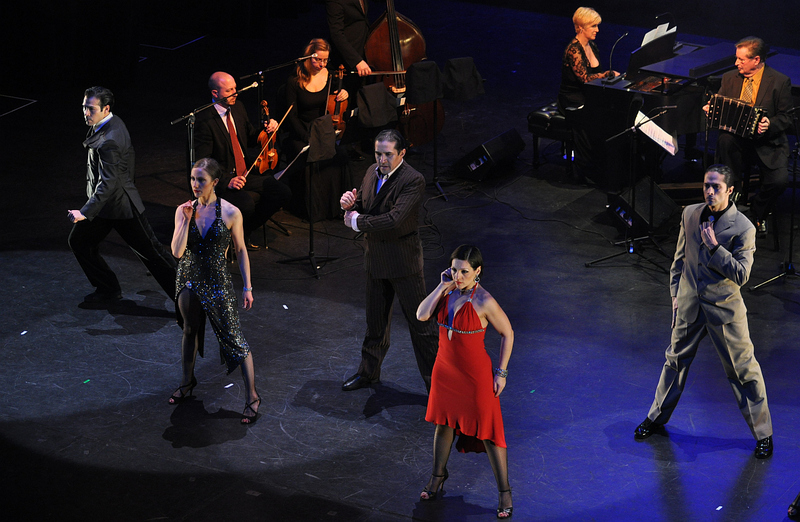 The concert concepts and recordings of the Ensemble, forming the Un siglo de tango collection, are recognized internationally. The Ensemble’s hallmark is a group of talented musicians, whose technical skills are complemented by their artistry. Residents of the province of Quebec (Canada), the musicians are graduates from the Quebec Music Conservatory in Montreal, the Université de Montréal, McGill University and UQAM. They have completed several courses out of the country with renowned masters in their respective disciplines. These master classes together with the work accomplished under the direction of Romulo Larrea has led to a dedication and discipline that have allowed the Ensemble to develop a unique approach to the genre, which has become a benchmark for aficionados, both novices and experts alike. The musicians of the Ensemble are: François Pilon, first violin; Frédéric Lefebvre, violin; Andra Giugariu, violin; Marie-Claire Cousineau, viola; Alexandra Gregova, viola; Martine Gagné, viola; Sheila Hannigan, cello; Alain Malo, double-bass and Louise-Andrée Baril, piano.